As the holiday season draws near, Priscilla the Pink Pig prepares to make her 56th appearance spreading cheer to more than five generations of children and families across Atlanta. A holiday tradition for many Atlanta families, Priscilla takes her place atop Lenox Square’s parking garage beginning Oct. 28 through New Year’s Eve, a home she’s held since 2003. Priscilla debuted in the early 1950s as a small train running along a monorail through the toy section of Rich’s Department Store. Introduced to draw more customers from the suburbs to the Downtown store, Priscilla quickly gained popularity and moved to the roof to take riders on a journey throughout the toy department and around the Great Christmas Tree. In the 1960s, Priscilla received a companion, Percival, running along the same track, garnering the name of the Pink Pig Monorail Twins. During the civil rights movement, Rich’s incited a boycott due to its refusal to serve African-American customers in the Magnolia Room, a restaurant inside the store. Before the 1961 Christmas season, Rich’s desegregated the store, including the Pink Pig Twins, a major win for the city and the civil rights movement. After Rich’s closed in 1991, the Pink Pig Twins moved to Egleston Children’s Hospital’s Festival of Trees for the next four years. In 1995, the twins made their last go around before retiring to Atlanta History Center. 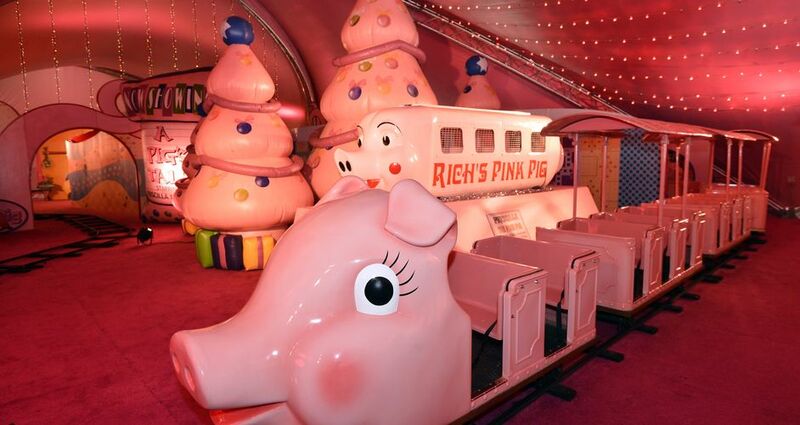 Priscilla found new life in 2003 as a new and improved 170-foot train ride underneath a Pink Pig 1950s-themed tent at the Macy’s location at Lenox Square. The original Priscilla the Pink Pig is on display as the train ride goes through a storybook adventure featuring Priscilla and several of her friends.